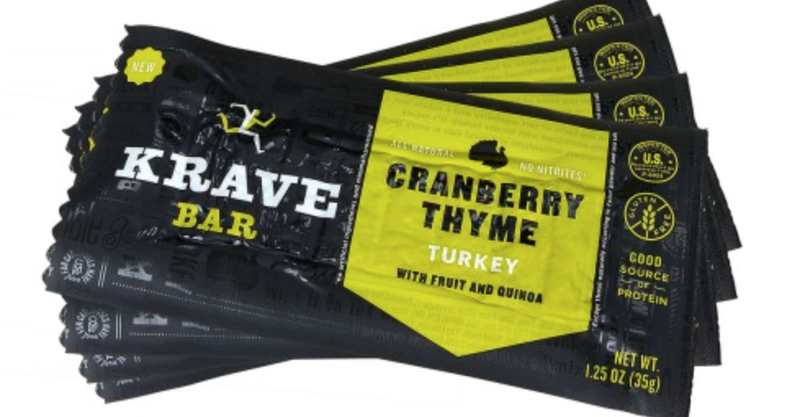 I was pretty psyched to see these new Krave Bars – they are available in-store and online, and come from a popular jerky snack brand, Krave. When trying to stay clean on trips, it’s always a struggle to find non-refrigerated protein options. It isn’t at all impossible, mind you, it just requires forethought. The great thing about these bars is that they offer savory flavors, and a dose of protein for minimal calories minus the need to have a cooler. There is a bit of sugar in there, so keep that in mind if you need to steer clear. That said, sometimes a snack like this is better than wheat you’ll find at rest stops! It’s also smart to have healthy snacks on hand so you don’t end up going hungry, and eating more than you’d like to later. The other thing? There isn’t much IN these, which is always nice. AND…you can pronounce all the ingredients. Refreshing! Turkey, Cranberries, Quinoa Flour, Candied Orange Peel, Granulated Sugar, Sea Salt. Contains 2% or less of the Following: Thyme, Sage, Granulated Garlic, Onion Powder, Lemon Juice Concentrate, Black Pepper, Celery Powder. Great option!! Thanks for sharing!! !